I think I'm cursed when it comes to marketing. 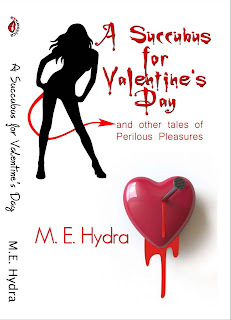 After a couple of weeks hyping up A Succubus for Valentine's Day as coming out on Friday the 11th, it doesn't appear for the kindle until the 12th, I'm still waiting for CreateSpace to unretire the print version so people can buy it and this post is a day late because my internet access went kaput over the weekend. Anyways, enough griping. It's out. Here's your antidote to the cloying tide of sugary sweetness that is Valentine's Day. The ebook is available from eXcessica, Amazon, Smashwords and various other online stores.